FOB Kitchen's tocino — house-cured pork shoulder, garlic rice, and sunny side up egg. The latest addition to the East Bay’s Filipino food scene is FOB Kitchen, in the former Juhu Beach Club restaurant in Oakland’s Temescal neighborhood. The new restaurant — which will be remade into a Philippines-inspired space with bright colors, decorative art, and ocean-inspired hues — is aiming for a late-September debut, with chef Janice Dulce at the helm and co-owned with her partner Brandi Dulce. Both have 15 years of experience in the restaurant business, with Brandi on the business side and front of the house and Janice as the chef. Janice previously worked at Out the Door, while Brandi was previously at A16 and Starbelly. This is their first venture in the East Bay. Serendipitously, they found the space on Craigslist, not knowing it was formerly occupied by Juhu Beach Club, operated by chef Preeti Mistry and her partner and co-owner Ann Nadeau. Both Mistry and Janice Dulce are queer, women of color chefs. FOB Kitchen is a tongue-in-cheek name the couple came up with after bouncing around words in Tagalog. Janice’s family is from the Philippines, but she was born and grew up mostly in Guam. The name “FOB,” which stands for “fresh off the boat” and has been used in a derogatory way toward immigrants, is actually an homage to Janice’s overseas roots. “We’re sort of sarcastic, rebellious individuals,” Brandi said. The couple has been running a pop-up service in San Francisco for three years. While they haven’t finalized the menu yet, Brandi said FOB Kitchen will serve all the favorites from their pop-ups, including homestyle silog dishes — which are served with garlic fried rice and a fried egg — such as tocino, thinly sliced, sweetly marinated pork shoulder with garlic fried rice and a sunny side up egg. Their other favorites include adobo, slow roasted pork spare ribs with a coffee rub, lechon kawali (crispy pork belly cooked three times), lumpia, and pancit. Pescetarians will rejoice at their pan-seared whole fish topped with a Thai chili-fish sauce. They plan to stay open until 11 p.m. on Fridays and Saturdays and will include a bar bites menu as well. In addition, they will add seasonal dishes as well as a cocktail menu created by Cali Gold, with drinks inspired by the Pacific islands. 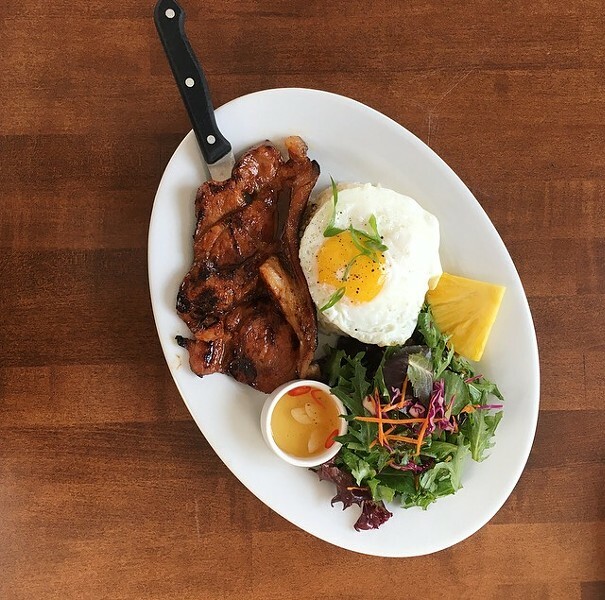 FOB Kitchen is part of a wave of new Filipino restaurants in the East Bay. Likha, owned by chefs Bobby Punla and Jan Dela Paz, who both previously worked at Ramen Shop in Oakland, opened up in Emeryville’s Hometown Heroes Sports Bar in June. Jeepney Guy by Dennis Villafranca officially opened last weekend at the new 7th West community and art space in West Oakland. So far, FOB Kitchen is the only Filipino restaurant in the Temescal neighborhood.